Americans are an extremely mobile people and move from one part of the country to another often. Since the Census released its most recent estimates of population change in the U.S., we’ve looked at international migration and the balance of births and deaths. The other big piece of the population-change puzzle is net domestic migration — the number of people who moved to each county from another county, minus the number of people who left the county for another. The most startling aspect is the mass of dark blue in western North Dakota and eastern Montana. It coincides with the Bakken Formation, ground zero of the recent shale oil boom. The map also shows the trend of people leaving areas in the Northeast and Midwest — and of people moving to the Southeast. 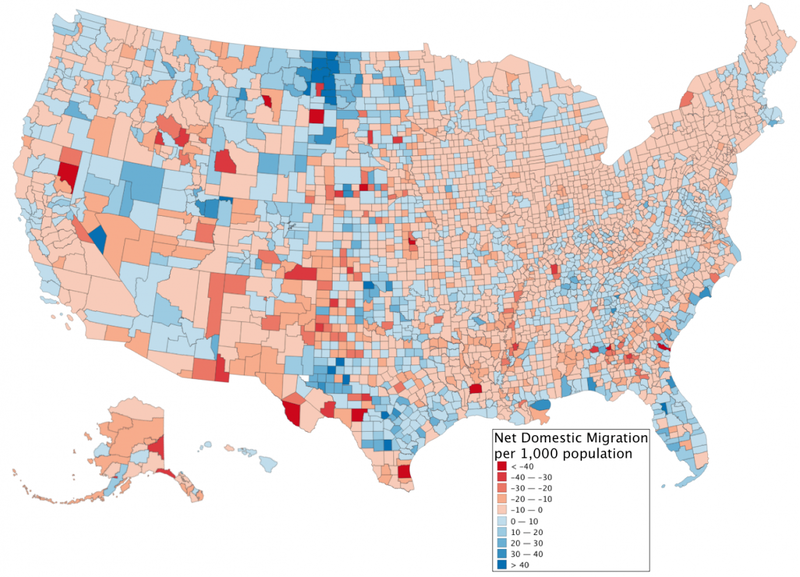 An important caveat here is that this map just shows aggregates — it does not give an indication of where people are coming from in the counties with positive net migration, or of where people are going to in the counties with negative net migration. Patterns of domestic migration vary highly from place to place and among different demographic groups in ways much more complicated than can be seen by just looking at aggregate net migration. For example, New York County — that is, Manhattan — had a net domestic outflow of about 16,000 people, from a starting population of about 1.6 million. This is all we know from this data set; this map tells us nothing about where those people went. They may have moved to Brooklyn or to Chicago or to Florida. That said, net domestic migration is still one of the major components of how populations change over time, and so is worth considering.